Oh, summer you truly have my heart when it comes to cooking. The seasonal vegetables this time of year are perfectly suited to satisfy our palates all the while being ideal for grilling out or roasting in. And here we’ve included all our favorite summer veggies. When your not sure what to make for dinner, this is an easy and quite enjoyable option. We are always looking for ways to ditch the grains and doughy breads for something more nutritious. Lettuce leaves are a popular choice, but tend to fall apart upon wrapping. 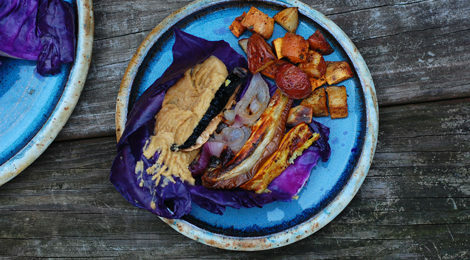 The cabbage, however, is a more substantial option that is sure to hold everything in place. 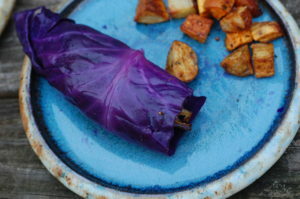 And once lightly steamed, the cabbage leaves are no longer too fibrous to chew. Not to mention, the purple cabbage is such a beautiful vegetable to add to this already full rainbow of plants. 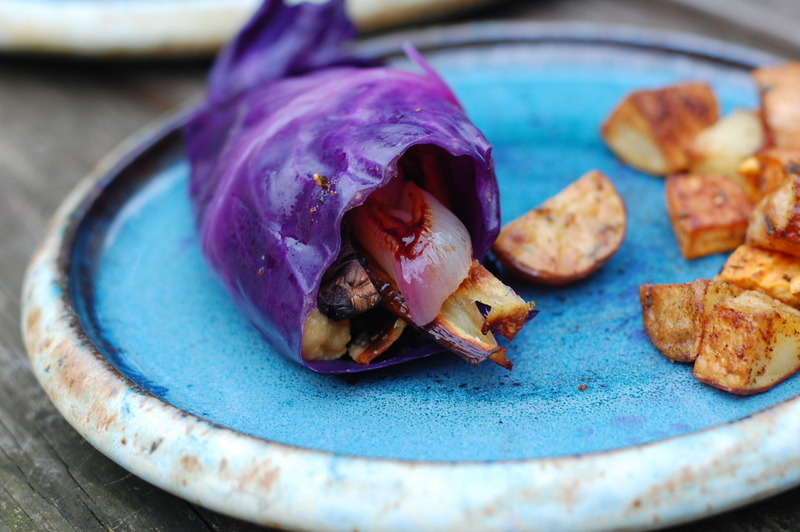 Arrange your roasted [or grilled] veggies along the spine of a steamed purple cabbage leaf just so. Add plenty of your favorite homemade hummus, and wrap it up for a fork-free dinner. Paired with some home fries or homemade potato salad, and dinner is served. Who ever said delicious meals have to be difficult? Do beware: cooked purple cabbage can stain, so keep your hands away from your clothes for a mess-free dinner party. Make your hummus and allow to cool in fridge. 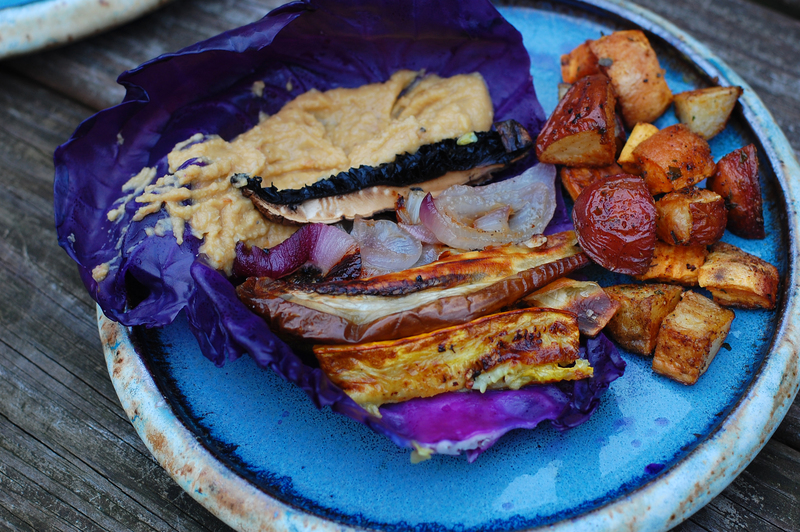 If you choose to roast your vegetables: preheat oven to 400°. Lay your cut vegetables on a baking pan in a single layer. Drizzle olive oil or add butter plus sea salt and black pepper. Roast in oven for about 20 minutes, flip and put back in oven for another 20 minutes or until they are browned nicely and soft. If you choose to grill your vegetables: start grill and turn flame to medium-low; allow to preheat. Prepare vegetables by drizzling with olive oil and adding sea salt and black pepper. Grill veggies, flipping occasionally until cooked through and nicely charred. Prepare a steam pot, and steam your cabbage leaves for about 4 minutes or until just barely soft, or al dente. 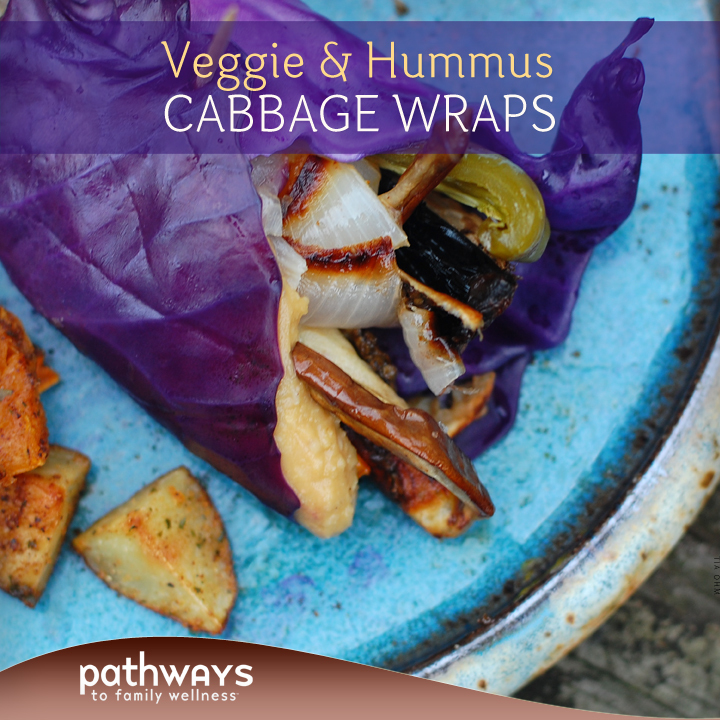 Take one cabbage leaf and add some of each of the vegetables plus a generous scoop of hummus.